The last masterpiece of the Dutch genius painter – group portrait “Sindiki”. Rembrandt carried out the order for the organization at the cloth guild in Amsterdam. Every year new members were elected to the council, whose responsibility was to control the quality of fabrics made in the city and the selection of the best samples of fabric. The artist wrote Syndic 1662 election. According to the tradition, clothmen were depicted in the number of five council members sitting at the table and one servant standing behind important officials. 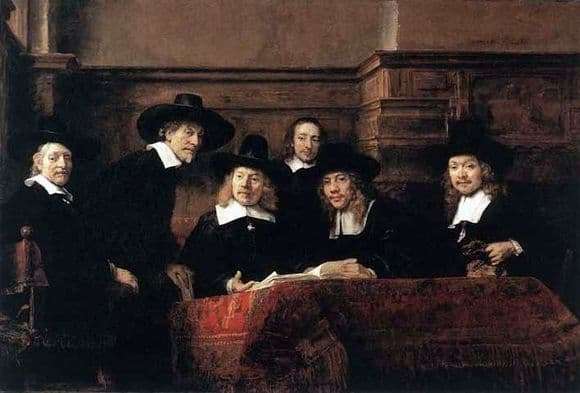 Rembrandt added a bit of dynamics to the composition: one of the meeting participants stood up from the chair, making it clear that the meeting was over. In addition, it seems that this venerable gentleman is in a hurry on urgent matters of special importance and there is no time for him to engage in such a meaningless waste of precious time as posing for a picture. On the table, covered with a red tablecloth of the highest quality fabric and the most exquisite taste, most likely lies the book of accounting, and perhaps the book with samples of satin and silk; on the right, a sitting official is holding a purse full of money. In addition to these symbols, personifying the craft of the Amsterdam Guild, the interior is decorated with a barely noticeable picture with a pattern of a lighthouse as a sign that the syndics embody the light and the guide of the institution. The artist showed us his ability to create on the canvas an emotional and mental unity, a virtuoso play of shadow and light. Rembrandt took into account all the wishes of customers when writing a picture, making their own artistic and compositional changes that are not at odds with their view of the group portrait. As a result, the finished canvas hung in the meeting room for more than a century, then it was transferred to the city government building, and now it flaunts in the Amsterdam State Museum.